Malaysia, as a member of the International Maritime Organisation (IMO) celebrated the World Maritime Week 2018, that is also celebrated globally with a vibrant theme this year – “IMO 70: Our Heritage- Better Shipping, For A Better Future”. The heritage of maritime pilots in the country is celebrated and acknowledged for their crucial roles in the safety of ship pilotage and navigation, public safety, protection of life and property, including the protection of environment at all ports in the country. Since Malaysia achieved independence in 1957, the establishment of ports in the country had been a catalyst to Malaysia’s economic development, where large volume of cargoes and raw materials that were imported or exported was freighted by cargo ships. It was a prudent cheap and effective means of transportation then and now. Literally, the traffic condition begun to rise and more number of ships called ports and harbour in the country. The captain of these cargoes ship or usually addressed as “Master”, were mostly experienced and comfortable navigating on the blue ocean that are wide and deep. However, as the ships are to transit into the port or harbour, the navigable waterways begun to be restricted with limited depth of waters and narrow waterways, accompanied with surrounding dangers and high density of traffic. And obviously, it would be dangerous for the Master to conduct his ship into and away from the harbour. For the interest of general public safety in the ports and harbours, the Government of Malaysia through the Marine Department or its respective agencies, the Port Authorities; made it a compulsory requirement for ships to engage a licensed professional maritime pilot when a ship transit within the port limits. The maritime pilots is given the burden of role and responsibility to conduct pilotage, dock and undock ship as maritime pilots are trained and licensed professionals who are familiar with the surrounding waterways, including location of dangers, high efficiency in ship-to-ship communication, navigational aids, tidal and weather condition including the handling of ships of any sizes and type. Capt. Cheng Sung Fong of Northport (Malaysia) Bhd, Capt. Mohd Sabri bin Amin of Bintulu Port Sdn Bhd and Capt. 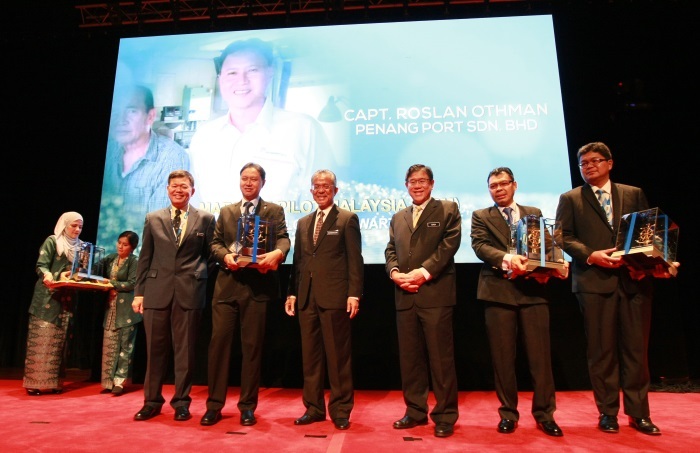 Roslan bin Othman of Penang Port Sdn Bhd received the Maritime Pilot Stalwart Award 2018 from the Deputy Minister of Transport, Dato’ Kamarudin Jaafar. They were shortlisted from an array of maritime pilots nationwide based on their outstanding professionalism, commitment in safety, protection of life and property and continuous contribution to the development and sustainability of port development, including shipping. According to the President and Chairman of Maritime Pilots Malaysia, Capt. Martin Lim, the inaugural presentation of the award to maritime pilots this year is indeed timely as the heritage of maritime pilots in Malaysia’s shipping and maritime industry set-off together then. “Maritime pilots have been an essential and crucial integral part of the port and harbour in the shipping and maritime industry, who contribute directly to the safety and security in the ports and harbour, public safety and protection of the environment. We will continue to exercise our professional roles and obligation for a better shipping and better future!” he added. The Malaysia World Maritime Week 2018 which outlined interesting international conference and exhibition opportunities for exhibitors, participant and the public is jointly organised by Ministry of Transport Malaysia, Marine Department Malaysia and Malaysia Shipowners Association (MASA).